Delivering non-fiction stories as an exciting film script; Epic Magazine turns long narrative journalism into a rollercoaster ride and, perhaps even more important, a profitable business. Journalists Joshua Davis (Wired) and Joshua Bearman (This American Life) search for – almost unbelievably – weird stories and turn them into beautifully designed longreads. Yet, these “Epic True Stories” mainly focus on text, and hardly integrate any other media (except for photographs). So why is Epic Magazine such a success? First; the stories live up to their promise. They are weird, touching and at times newsworthy. The titles include: “The Cold War” (about a local fight between icecream trucks) and “Arab Spring Break” (about a burn-out Wall Street banker who joins the freedom-fight in Libya) Second; they are incredibly well-written. They read like short novels. Often when reading a longread, I scroll to the end to see how long it will takes – even when it’s interesting and well-written. Here, I didn’t feel the need once. However, they are long – very long. I am curious about their statistics. Do people often complete them or not? Have you seen “Argo” with Ben Affleck? Good. It’s based on one of Bearman’s stories. This is part of their business model (as they explain in this FastCompany article); selling their longreads as film scripts. And it’s working. Eighteen of them have already been sold to Hollywood, which is not surprising; there has been a significant surge in “based on true events” movies. However, do they just make stories to sell them as movies? No. Not unlike Vice, they also approach possible sponsors and ask them if they would like to finance a certain story. It’s kind of like a network selling its shows to advertisers before it has even started filming. 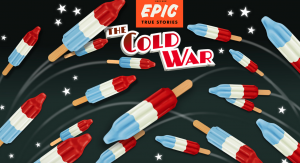 Does Epic Magazine represent the future of long narrative journalism? In her article, Bell argues that “good journalism has always been subsidized.” I think Epic Magazine proves that this isn’t necessarily true. Unlike Vice, Epic Magazine does not allow their sponsors to determine content. Instead, they approach sponsors with a story (and audience) that might fit with their brand. While any collaboration with advertisers is tricky, it’s also necessary. As long as it doesn’t intervene with the content, it’s not that much different from an advertisement in the paper. And, after all – we cannot do it for free. Bell, Emily (2007) “The Future: Journalism and Media as Post Industries”. Tow Center for Digital Journalism. In October, de Correspondent organized “The Month of Forgotten Histories”. For one month, the platform published stories on colonial and otherwise neglected chapters of Dutch history. By telling “the stories that do not appear in schoolbooks”, de Correspondent aimed to start “an honest conversation on identity, inequality, racism and discrimination.” It’s not the first time de Correspondent promotes a certain political agenda. What happens when journalists step into the activist sphere? According to McQuail, “journalism provides the basis for society-wide public debate and participation.” (McQuail, 6) Here, McQuail also admits that whatever is put on the table depends on the individual journalist. What does he or she see as primary task? (7) At de Correspondent, editor-in-chief Rob Wijnberg encourages his journalists to be open about their political attitude and agenda. During the national elections, Wijnberg even wrote a column about his own voting-preference, while other Correspondent articles selected political parties that their readers should vote for if they cared about the environment or social equality. Clearly, de Correspondent is not afraid to push for social change and politically influence its readership. As McQuail poses the question “What is journalism?”, he neglects to address the consequences of (intentional) subjectivity and journalistic politics. When does journalism end and activism begin? Identifying different types of journalists, Hanitzsch and de Vos categorize “the missionary role” that promotes “particular ideals, values and ideologies”, as well as the “change agent […] advocates for social change and drives political and social reform”. (10) Both roles can be recognized at de Correspondent. They clearly support diversity in education. However, as the journalists are mainly aiming to open up a conversation and tell stories that haven’t been told, I think their agenda is still within the journalistic margin. Nevertheless, de Correspondent is walking a slippery slope. Can audience data save local journalism? Last week, five American cities lost a source of local news (again). DNAinfo and the Gothamist were shut down by CEO Joe Ricketts after newsroom staff voted to unionize. While the owner’s personal interests played a huge part, both platforms hardly made any profits. 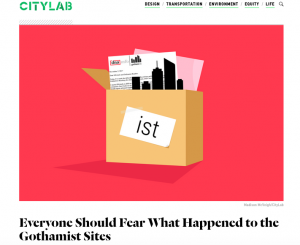 On CityLab, former LAist editor-in-Chief Julia Wick wrote how the shutdown “effectively amounts to a silencing” that adds to the lack of critical, local information; creating a democratic shortage. But how do we guard other local newsrooms against a similar quick death? A few days later, the Columbia Journalism Review published an article called “8 strategies to save local newsrooms”. Ali and Radcliffe emphasize the importance of original, local news stories and “owning the master narrative of the community”. Based on 53 interviews with industry seniors, their article suggests a narrow focus on topics that align with the community’s most pressing concerns. Most of these editors argued a specified use of audience metrics can help determine the affairs that will connect readers to your platform. According to Tandoc Jr. and Thomas, such an emphasis on audience metrics actually taunts the journalist’s role of public watchdog. (Tandoc Jr. and Thomas, 244) While their article argues journalism needs to facilitate “a culture that encourages dialogue”, they suggest only journalists should bring topics to the table. (245) To Tandoc Jr. and Thomas, journalists can only fulfill their communal part by supplying what the audience needs, instead of what it wants. This attitude is not just condescending to the intelligence of the audience, but also oblivious to the various ways in which data can be implemented. As explained by the Columbia Journalism Review, data can improve user experience and storytelling techniques, while a critical and selective use can prevent the growth of celebrity news and cat stories that Tandoc Jr. and Thomas fear. Tandoc, Edson C., and Ryan J. Thomas. “The Ethics of Web Analytics.” Digital Journalism 3.2 (2015): 243– 258. Taylor and Francis+NEJM. Web. While current Dutch examples are evident and named many times – the Correspondent, Follow the Money, The Post Online – one can already recognize the idea of journalistic ‘start-up’ or ‘split up’ culture in the 1940s. During the war, Trouw was founded as an underground newspaper by a group of former Vrij Nederland reporters who disagreed with the illegal magazine’s political stance. While a christian-orthodox newspaper would not classify as particularly innovative today, Trouw firmly agitated against the German occupier and offered a ‘new’ and different political, as well as religious perspective. In this light, I would argue that while the idea of ‘start up culture’ might have emerged in the 21st century, similar kinds of ‘split up’ media entrepreneurship were already practiced sixty years earlier. While today’s examples are different because of the possibilities of the internet, the Correspondent or The Post Online primarily exist because their founders, not unlike those of Trouw, agitated against the status quo. In other words; it’s less about technology and more about content. For example, when Rob Wijnberg parted ways with nrc.next, the Correspondent introduced a slower form of newsmaking – focused on young, educated urbanites – that he could not make at nrc.next. Likewise, the rightist voice of The Post Online was founded as a counter response to the leftist, activist platform Joop.nl. As such, the ‘ancient’ motor behind journalistic innovation is not (just) technology but a call for alternative content. Deuze, Mark & Prenger, Mirjam, “The structural history and theory of innovation and entrepreneurialism in journalism”, forthcoming in Boczkowski, Pablo & Anderson, Chris, Remaking the News, Cambridge: MIT Press. 2016. Print. As the traditional focus on television shifts towards interactive content, cable providers have to step up their content game to compete with Netflix, as well as each other. Here, Mierzejewska and Shaver argued the ”shift in consumer power means that content creators can – and must – focus on niche audiences to create sustainable segmented audiences.” (Mierzejewska and Shaver, 49) In the Netherlands, KPN and Ziggo make up for 85% of the TV market. However, both providers try to (re)connect to all Dutch consumers by focusing on gathering as much content as possible. Here, there is no visible focus on a certain audience; KPN and Ziggo seem to want them all. From January 1st, HBO became exclusively available on Ziggo Movies & Series XL. In result, the only legal way to watch Game of Thrones was to own a Ziggo mediabox. Meanwhile, only Ziggo Sport Totaal owned the Dutch rights to Formula 1. 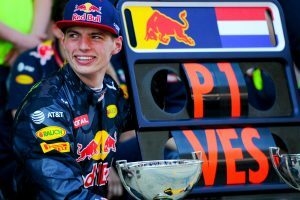 Thus, Ziggo did not just own Jon Snow, but also Max Verstappen. In result, it became attractive to auto sport, as well as “fantasy” fans. Despite the focus on exclusive content, Ziggo thus obviously does not target a specific or homogenous audience. In response, KPN provided its customers with new content in 2017. It launched a new original series called Brussel and upgraded its international, as well as its Dutch assortment. Debunking Mierzejweska and Shaver’s argument, KPN’s content is various and not specific. Even more so, while KPN owned the rights to Fox Sports Eredivisie, it also successfully negotiated with Ziggo to make their sports’ channel available on KPN. Because of this, KPN and Ziggo’s content even deliberately overlapped, as Max Verstappen became available through both providers by their own doing. As such, magnitude seems more important to Dutch providers than the exclusivity or focus. Bozena Mierzejewska & Dan Shaver. “Key Changes Impacting Media Management Research.” International Journal of Media Management 16 (2014). Print. Thinking of active political framing, the Prime Minister’s pre-election momentum immediately springs to mind. Four days before the national elections, the cabinet denied the Turkish Minister of Foreign Affairs his landing rights. In preparation of a referendum that would grant President Erdogan more constitutional powers, Çavusoglu was supposed to campaign in the Netherlands. Chong and Chuckman already suggested that competition on core values can add to a frame’s power to change public opinion. 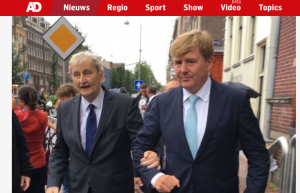 (Chong and Chuckman, 113) Standing up to an unpopular EU candidate with autocratic tendencies, Rutte not only showed political strength, but rigid ‘democratic morality.’ In Erdogan – especially after he referred to the Dutch as Nazis – Rutte found a foreign competitor to serve as the perfect contrast to his frame. 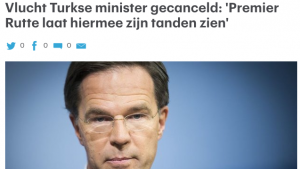 Rutte’s effort was met with an uncritical stage. As argued by Schuck and Feinholdt, frame building is not an isolated process that is ventured on alone; it’s a joint effort between journalists, political elites, the public and other actors. 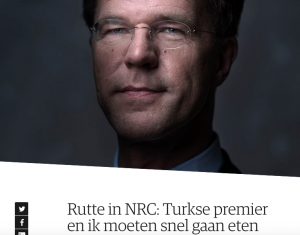 (Schuck and Feinholdt, 2) Three days before the elections, NRC published a large interview with Rutte. The slightly leftist newspaper portrayed the conservative politician as a true statesman who put campaigning on hold because he “simply” had to do his “unromantic” job. Other media like RTL Late Night followed their example. However, while social media was mostly buzzing with collective approval, the conflict’s influence on the elections might be slightly exaggerated. Most polls already predicted Rutte’s party to win before. As Chong and Chuckman discussed, people with strong beliefs are unlikely to switch sides because of a well-framed story. 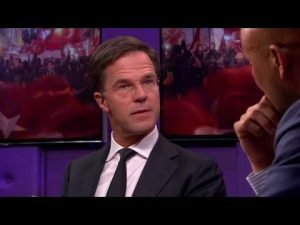 (Chong and Chuckman, 114) While Rutte’s (media) momentum might have pulled in some voters that were already on the right side of the spectrum, his “true statesman” frame – like most – was probably mostly preaching to a willing choir. Schuck, Andreas R.T., and Alina Feinholdt. “News Framing Effects and Emotions.” Robert Scott and Stephen Kosslyn eds., Emerging Trends in the Social and Behavioral Sciences (2015) Print. Chong, Dennis, and James N. Druckman. “Framing Theory.” Annual Review of Political Science 10.1 (2007): 103–126. Print. Tonight, two thousand people hit the ‘attend’ button to join a collective applause on the Herengracht. 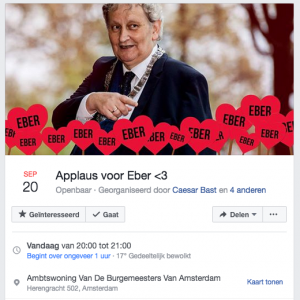 It is a tribute to Eberhard van der Laan, the resigning mayor of Amsterdam. Van der Laan – whose fatal illness has been public knowledge for months – send a letter of farewell to all “Amsterdammers” on Monday. The event flooded the media and the initiator was even invited to RTL Late Night. Naturally, local newspaper Het Parool thoroughly covered the last months of its beloved mayor. 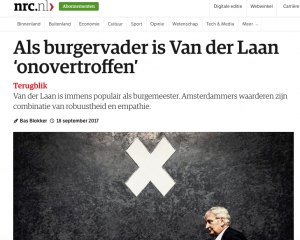 However, national media also closely followed van der Laan since the first letter, which announced his wish “to remain your mayor for a while” in January. But why? Above all, the story of van der Laan seems to fit into Galtung and Ruge’s “scarcity” factor. (Galtung and Ruge, 70) Illustrated by praising articles in NRC and HP/De Tijd, the mayor is portrayed as a politician who can be trusted and ‘gets things done’ at the same time. Staged or not, a politician who gains public affection is a rare sight that many people – including journalists – obviously like to be a part of. Galtung, Johan and Mari Holmboe Ruge. “The Structure of Foreign News” Journal of Peace Research 2.1 (1965): 64-91. Print. Harcup, Tony and Deirdre O’Neill. “What Is News? Galtung and Ruge revisited.” Journalism Studies 2:2 (2001): 261-280. Print. On October 30, 1938, Orson Welles’s lively radio adaption of “The War of the Worlds” frightened many Americans into believing that their nation was under alien attack. A fine example of “early fake-news panic”, says The New Yorker’s Adrian Chen. By revisiting the mass power of the radio, Chen puts the Internet’s fake news scare into a refreshing historical perspective. Comparing the 1930s media portrayal of “War of the Worlds” mass hysteria to the much more nuanced image that dominates current research – the majority of Americans recognized the incident as fun fiction – Chen reminds us to have a little more faith in ourselves and our fellow news consumers. Most listeners could distinguish fact from fiction, even without being specifically warned. And we still can. However, as Caplan and boyd remind us, today’s social media platforms turned into personal news curators: automated “gatekeepers” who increasingly “classify, filer, and prioritize” the news that pops up – and remains hidden – on our newsfeeds and minds. (Caplan and boyd, 5) In other words, these algorithms offer us a clean, censored view of the world by doing the ‘cherry-picking’ for us. While these algorithms are often still perceived as objective computers that operate without bias or interests, Caplan and boyd emphasize the human partiality of the people behind the code. (Caplan and boyd, 7) And who is to say that a coder is better at separating the chaff from the grain than a regular human being? Besides, The New Yorker article rightfully wonders if utilizing algorithms to filter out fake news “will only further entrench our reliance on code to tell us what is important about the world”. Just think about it: in a code-curated version of the 1930s, “The War of the Worlds” would have been filed under “baloney” or just immediately hidden from our view. From this perspective, algorithms not just ridicule our ability to separate fact from fiction; they will eventually ruin our fun. Caplan, Robin, and boyd, danah. “Who Controls the Public Sphere in an Era of Algorithms?” Data&Society (2016). Online. Chen, Adrian. “The Fake News Fallacy.” The New Yorker (September 4, 2017) Online.